This page was put together for the use of my students reading Old English texts at Washington State University, and is now dedicated to the stalwarts in English 370, bringing back the Middle Ages on Tuesdays and Thursdays this Fall. Unlike some stingy sites (including several from the U. of Virginia whose links I have just expunged), it's not restricted to our students, however, so anyone happening upon this page should feel free to have a look and follow the links to some wonderful sites. Godspeed. The Heroic Age: A Journal of Early Medieval Northwestern Europe. This is a really top-notch site I have just discovered, full of excellent links to texts, manuscript images, and bibliographies. Well done. The Electronic Introduction to Old English: An on-line analogue of Peter S. Baker's Introduction to Old English (Oxford: Blackwell), 2003. A very useful resource. The Electronic Beowulf Project , directed by Profs. Kevin Kiernan and Paul Szarmach, has assembled a huge database of digital images of the Beowulf manuscript and related manuscripts and printed texts. The site displays a few of the amazing enhanced images as a way of advertising the project's CDs. The cutting edge of digital preservation and restoration. The ORB (Online Reference Book) Internet Medieval Sourcebook contains some fascinating original texts dealing with Anglo-Saxon history and culture. Anglo-Saxon Studies Page (Stanford University Libraries) --lots of good links and bibliographical material. The Labyrinth at Georgetown offers twenty-seven pages dedicated to Old English texts, manuscripts, and culture. Just click on "English, Old," and off you go. Anglo-Saxon Studies: A Select Bibliography by C. P. Biggam; very full, impressive collection and presentation. Prof. Anne Savage of McMaster University has produced a brilliant site, Beowulf in Hypertext, including a Modern English translation. An anonymous Modern English translation appears at the University of Virginia. Prof. Murray McGillivray's Internet OE Course at U. of Calgary provides a grammar and several glossed texts. Regia Anglorum: Anglo-Saxon, Viking, Norman, and British Living History is a British organization that stages re-enactments of medieval life; these folks seem somewhat more sophisticated than our native Society for Creative Anachronism (the link is to a demo site). "Angelcynn": Anglo-Saxon Living History 400-900 A.D. : this interesting site has disappeared, alas, but a link to their page on "Clothing and Appearance of the Pagan Anglo-Saxons" survives here. "Bede's World", The Museum of Early Medieval Northumbria at Jarrow, a 100-acre site dedicated to recreating the Age of Bede. Britannia Magazine: Anglo-Saxon Period contains useful timelines, narrative histories, and historical summaries, sometimes in a regrettably unreadable uncial script. This page maintained by Prof. Michael Hanly, Department of English , Washington State University, Pullman WA, U.S.A., 99164-5020. E-mail address: hanly@wsu.edu. Last updated 17 August 2011. Wes thu hal. 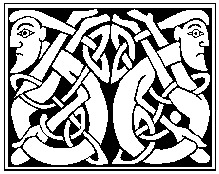 CREDITS: The "Anglo-Saxon clip art" reproduced on this page is by Eva Wilson, Early Medieval Designs from Britain for Artists and Craftspeople, Dover Books, 1983.